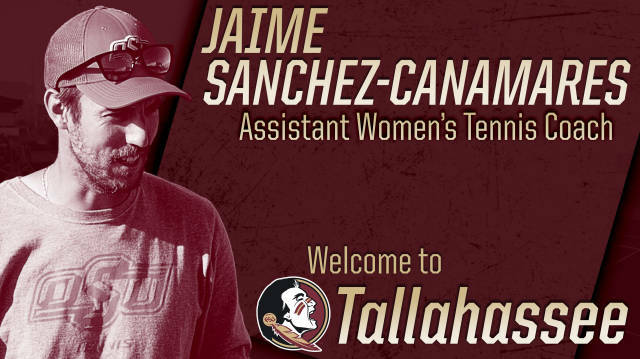 TALLAHASSEE, Fla. – Jaime Sanchez-Cañamares has been named assistant coach for women’s tennis, head coach Jennifer Hyde announced Wednesday. A former ATP professional and ITA All-American, Sanchez-Cañamares spent last season on the coaching staff at Oklahoma State. Sanchez-Cañamares helped lead the Cowgirls team to a 25-6 record in 2017, a year in which Oklahoma State reached the Big 12 Championship final as well as an Elite Eight appearance in the NCAA Championship. Additionally, four Cowgirl players competed in the 2017 NCAA Individual Championships. Sanchez-Cañamares was a standout during his time at Fresno Pacific, Oklahoma Christian and Embry-Riddle, earning ITA/NAIA All-America honors all four years, as well as the 2014 ITA/NAIA National doubles champion crown. He also led Fresno Pacific and Oklahoma Christian to NAIA National titles in 2011 and 2012, respectively, while leading Embry-Riddle to national runner-up performances in 2014 and 2015. Sanchez-Cañamares reached as high as No. 1 in the ITA/NAIA national doubles rankings, while also earning a career-high No. 13 ranking in singles. He also paired up with Embry-Riddle teammate Deni Zmak to claim the USTA/ITA Super Bowl Doubles Championship in 2014. Sanchez-Cañamares was named both NAIA Scholar Athlete and ITA Academic All-American in his career while maintaining a perfect 4.0 GPA as a student-athlete. Prior to his time at the collegiate level, Sanchez-Cañamares spent nearly six years on the ATP and ITF pro circuits from 2004 to 2010. After playing collegiately, Sanchez-Cañamares coached elite junior and professional players at Saviano High Performance Tennis in Plantation, Fla., including international standouts Eugenie Bouchard, Samantha Crawford and Amanda Anisimova. A native of Albacete, Spain, Sanchez Cañamares graduated from Embry-Riddle in 2015 with a Bachelor’s Degree in Business Administration, specializing in Accounting and Finance.